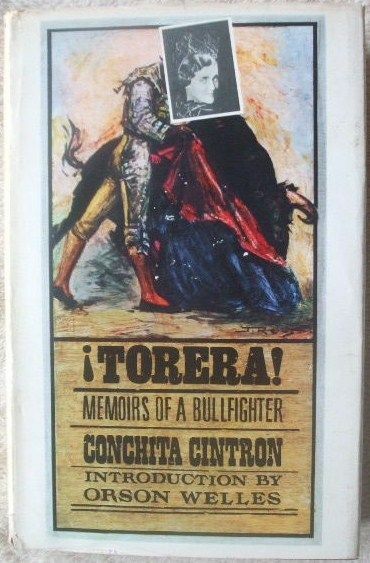 First English edition, first print hardback of TORERA: Memoirs of a Lady Bullfighter, by Conchita Cintron and published by Macmillan & Company Ltd., London in 1968. With an introduction by Orson Welles. First published in Spain in 1962 under the title 'Recuerdos'. The book is in very good condition (clean brown cloth boards and silver lettering on orange decorative label background on spine) with some light wear to the dust jacket, which is not price clipped (slight creasing to edges, two small closed tears, one on the top edge at the back and another to the bottom spine corner, very slight chipping to spine edges and some tanning/ foxing inside the jacket). Internally, the pages are clean and tight and there are no tears and no inscriptions. There is some tanning and age spotting to page ends and light fading to the pink endpapers. Juan Belmonte said of Conchita Cintron, 'A unique figure in the history of bullfighting.' Fleur Cowles Meyer has called her 'the only great bullfighter who is a woman.' Miss Cintron is undoubtedly this century's most renowned and respected woman bullfighter. Concepcion Cintron Verrill, also known as Conchita Cintron or La Diosa de Oro ('The Golden Goddess') was a Chilean torera (female bullfighter), perhaps the most famous in the history of bullfighting. In the ring Cintron was said to display particular grace, style and bravado, a combination known as duende. She first fought in public in the Plaza de Acho, in Lima, in January 1936. On July 31, 1938 she made her debut as a novillera, also in Lima. This event established her as a professional rejoneadora, a rare (but not unprecedented) honor for a woman. After a trip to Portugal, she was invited to perform in Mexico. She made her Mexico City debut at the Plaza del Toreo on August 20, 1938. She failed to kill her bull, but nevertheless was a great hit with the crowd and the taurine critics. She was reported to have 'caused pandemonium in the stands'. She was gored in 1940 in Mexico City, by the bull Chiclanero. She fainted and was taken to the infirmary, but refused surgery and returned to the ring. There with one quick thrust she dispatched the bull and collapsed. From her Mexico City debut in 1938 through the 1940s, she was a big draw on the bullfighting circuit, in Mexico, Portugal, southern France, Venezuela and Colombia. She even fought once in the United States, near San Francisco, in a corrida in which the bull was not allowed to be killed. Her final bullfight was legendary. It was in Spain, in 1949, and as the fight ended, she flouted the Spanish law that prohibited women from fighting a bull on foot. Dismounting, she allowed the bull to approach her but did not kill it, touching the bull lovingly with her hand instead as it hurtled by her. Another bullfighter completed the killing. She was immediately arrested, and then pardoned, as the crowd cheered, and she was awarded the highest honor of the ring: both of the bull’s ears and the tail. She wept as she left the arena. In 'Torera! Memoirs of a Bullfighter' she traces her life and career on three continents and offers insights and revelations into the drama of 'la Fiesta Brava. When her autobiography, 'Memoirs of a Bullfighter,' was published, an article in Vogue described how she got used to the idea of killing by practicing at a slaughterhouse, for days on end jabbing in vain at doomed oxen with a dagger. She retired from bullfighting after having killed as many as 750 bulls in the ring, died in Lisbon when she was 86. "Conchita Cintron, the world's most famous and respected woman bullfighter, first entered the bullring when she was thirteen . She was no nine days wonder, but revered and skilful performer, whose subsequent victorious career carried her through Mexico, Colombia, Ecuador, Venezuela, France, Morrocco and finally Spain. Early in her career, Conchita Cintron was accepted and accorded the title of "torera" by the closed, masculine society of bullfighters. The Twentieth century's most famous bullfighters were her colleagues— Belmonte, Manolete, Ordonez, Balderas and Carnicerito de Mexico—and she speaks of them with candour and insight. The banderilleros, the apprentice matadors, the hangers-on, the sword-handlers, the ranchers, the constant travel, the glamour and acclaim, these made up Miss Cintron's life and world, and she writes of them all with humour, excitement and intelligence. James A. Michener writes 'She was to bullfighting what Sonia Henje was to skating, or Helen Wills to tennis, or Pavlova to dancing. She was one of the great women performers of the world. To read her modest account of her achievement is to relive those golden days in Mexico. I am glad that friends brought her book to my attention, for my heart still skips a beat when I recall her first entrance into the ring, the frail blonde Sevres figurine who bewitched us all. To have known her was to have known the best." 272 pages & glossary. Illustrated with monochrome photographs throughout.